earned the highest score ever awarded in the sixty year history of the National Horse Cutting Association World Finals. Bet Yer Blue Boons is a red roan mare with a champion pedigree, and she and her rider practically qualify as Quarter Horse royalty. The American Quarter Horse is a short, stocky breed developed in America as a cattle working horse. It is named "quarter" for its speed over the quarter mile - as a working breed that has to sprint, stop on a dime and turn, the American Quarter Horse has a remarkable speed over short distances. Pottery Barn has commissioned several Exclusive Breyer models in the past, including a really nice model in 2007, "Gray Morgan Stallion" which used the Kennebec Count Morgan mold. Pottery Barn's Gray Morgan Stallion proved to be quite popular, as well. Remove tag stain from glossy Poncho Rex???? I was stupid and packed away my Poncho Rex with the red hang tag still around his neck. There is now a faint pink stain. Can anyone offer tips or advice on how to remove this stain? Read more about Remove tag stain from glossy Poncho Rex???? The other new Breyer Rare Breeds model which is being released this year is Sheik, an American Knabstrupper. Sheik, a four year old stallion, is the first American Knabstrupper to pass the incredibly challenging Rheinland Pfalz-Saar International 30 day stallion competition. The Knabstrupper is a Danish breed of horse with the oldest breed registry in Europe, first established in 1812 when a cavalry mare caught the eye of a horse fancier and butcher named Flaeb. Flaeb purchased his mare from the Spanish cavalry, and it is believed that the breed dates back to a prehistoric spotted horse which was native to Spain. 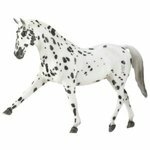 Breyer has announced two new models for 2009. The first we will look at is Kuchi, a Gypsy Vanner, and the first of that breed to be born in America. Kuchi, bred by Dennis and Cindy Thompson who are famous for having popularized the Gypsy Vanner in America, is celebrating her tenth birthday this year. Her mother was Bat, and her father is The Gypsy King, who is also a Breyer model. Kuchi is undeniably important to the Gypsy Vanner breed in America. She has had eleven foals, and is a Grand Champion Halter Mare. Kuchi is owned by Bill and Wendy Ricci, who have three Gypsy Vanner farms, and have developed several great lines of Vanner of their own. What would be the right price for these breyers? I have two breyers I have kept in the boxes and I am considering selling them. The first one I have is an original model of Barbaro. This is the one that comes with the certificate and has the golden signatre below its belly. This was the one that was out for a few days before it was retired. But they did make another model. How much would that be worth? Also, I have a model of Theodore O'Connor signed by both Karen and David O'Connor. The box and its right side are both signed by both of them. How much would this one be worth? I need to know as soon as possible. Please respond. Read more about What would be the right price for these breyers?